Procam NY is a professional broadcast and digital cinema rental facility that specializes in cameras, audio, lighting, crewing & production services. Located in the heart of Manhattan, Procam NY offers the best in digital video and motion picture rental, coupled with extensive services, including project management, workflow consultancy, technical training and crew. From a single camera unit to a full multi-camera setup, lenses, filters, VTRs and more, Procam NY can provide everything you could need for a drama, factual, entertainment, reality or corporate shoot. All services are accompanied by extensive 24/7 technical support to keep you shooting. Ongoing consultancy and technical knowledge is what sets us apart from our competitors. Offering a personalized and reliable service, our bespoke packages are made to suit your production needs. Our equipment is rigorously maintained and thoroughly inspected by our knowledgeable in-house team before leaving the equipment room, and our office space also allows you to get hands on equipment to test yourself when making important choices for your production. Our highly skilled and experienced technicians, engineers and production staff are here to facilitate all your needs. Covering the globe from here in New York and aligned with our Procam branches in London, Manchester, Glasgow and Edinburgh, we offer a seamless rental experience when shooting across the pond. We carry the same values as our partners in the UK, which means we deliver the same exceptional service to you, wherever you shoot. We are dedicated to delivering our clients with top quality Equipment Rentals, Cameras, Audio, Lighting, Crewing and Production Services. Procam NY provided a range of gear and crew for the production of Jaguar's film, 'Baby Driver Test Drives Electric Jaguar I-PACE'. The Brooklyn-based shoot featured actor and musician Ansel Elgort and racing driver Davy Jones. Catch the video here. Procam NY brought together a crew of over 30 technicians and Production staff to keep the video shoot running smoothly until the last note was played. Whether it’s a small Flypack setup to live stream for your clients, or multi-camera arena show, we have you covered. Procam NY's team was part of a 90-strong production crew that filmed people snorkelling and surfing for Virgin Holidays' live-streamed advert. Procam NY was brought in to capture footage of the New York City skyline via a helicopter. 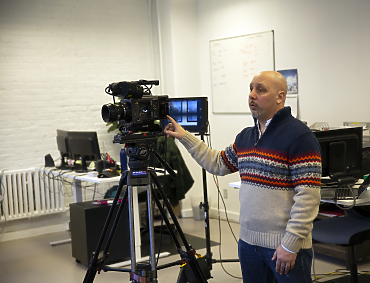 We also provided camera operators, sound and encoder technicians for shoots in Brooklyn. Procam NY supplied ARRI Amira and Alexa Mini kits, Sony A7Sii’s, Angenieux Optimo lenses, full camera support and audio packages for Ronnie O'Sullivan’s American Hustle. The series follows O'Sullivan as he travels to various cities in the USA, exploring and discovering the history and American culture of the game of pool.